The past several months have been a whirlwind of intense creative activity, all of it leading up to this weekend: the Lake Oswego Festival of the Arts, from June 26-28. I had the privilege of helping to curate a special exhibit called “On the Fringe: Today’s Twist on Fiber Art.” Not only did we receive many beautiful and creative pieces for the exhibit–including works as unique as knitted glass, a silk reproduction of an atomic bomb, and a huge worm crocheted from copper wire–but the exhibit served as inspiration for two installations on the outside of the Lakewood Center itself. 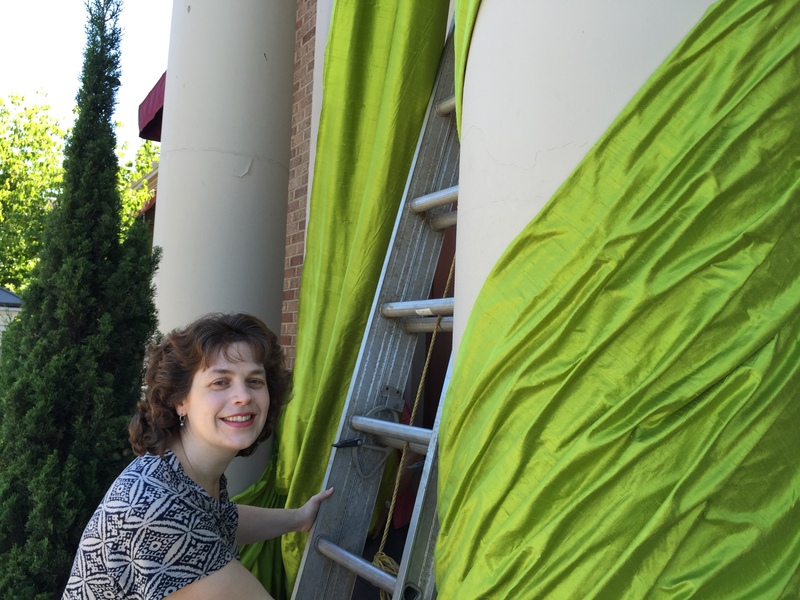 We were very fortunate to have not one but two incredible installation artists for “On the Fringe.” The back entrance of the Lakewood Center was transformed by Barbara De Pirro, whose work focuses on recycling and sustainability. For “Flourish,” she used 3000 bottle caps, each of which had to be drilled with four holes. She also created large garlands of colorful beads with 750 bottle caps and a smattering of small toys. The netting is made of milk cartons that have been cut into ribbons! 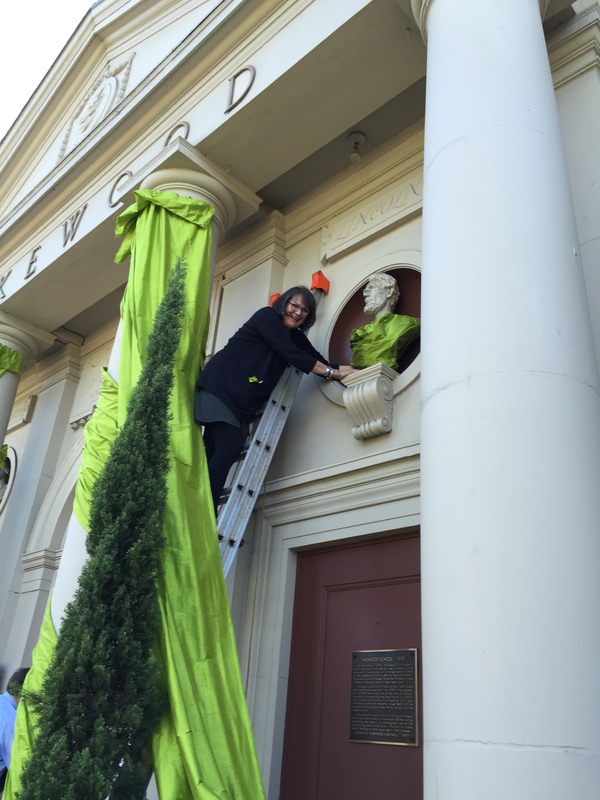 The process of hanging the silk on the building was quite challenging; Janice calls installation a “thrill sport” for a reason. It required the help of an intrepid young architect named Woodrow, who was willing to get up on a very high ladder and meticulously manipulate and pleat fabric around a bungee cord as Janice directed him. Thank goodness he also has a background in mountaineering! You can see below that Janice also went up on the ladder. 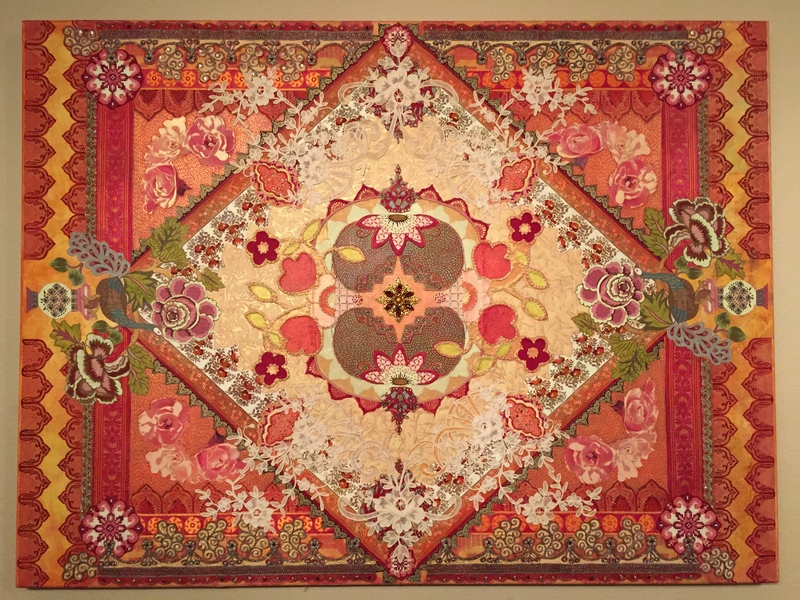 She had just enough fabric left at the end to create little silk shawls for Abraham Lincoln and George Washington, which added just the perfect sense of whimsy and celebration to the installation. Fortunately, I had the much safer job of holding the ladder. Janice also created a site-specific installation for us in “On the Fringe” itself—it is part of an installation that she exhibited at the Grand Rapids Art Museum in Michigan a few years ago. She reconfigured two large felt pieces from the original “CHROMA Passage” and calls the piece for our exhibit “CHROMA Passage—Dissected.” It is a very colorful and immersive environment, and it takes the viewer on what she describes as a nomadic wandering journey, which references the nomads who make felt. The major inspiration for CHROMA Passage was a spectacular sunset that Janice saw outside her studio; you can see this reflected in the dramatic spectrum of color in the piece. Parallel to my work planning “On The Fringe,” I have also been pushing myself over the last several months to finish an ambitious beaded painting for inclusion in the special exhibit. I did manage to get it finished just in time; like many of my larger beaded canvases it required a total of almost 300 hours to create. 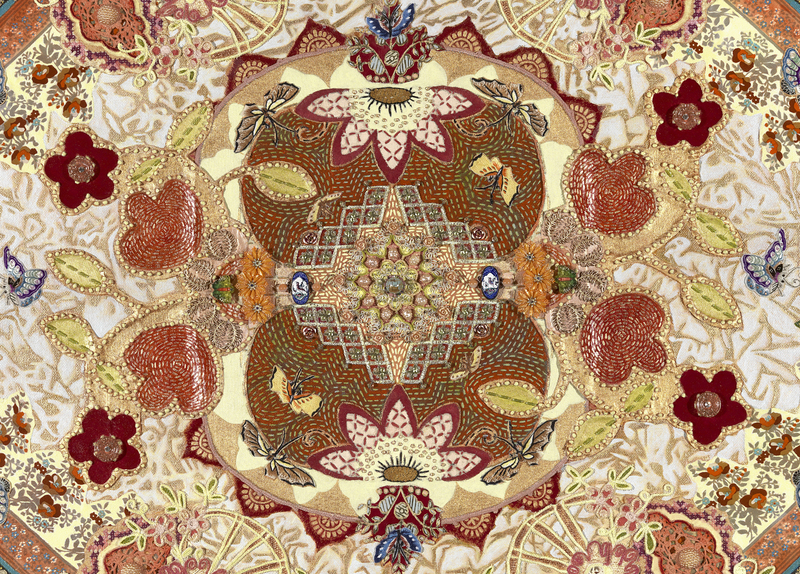 My pieces often begin with textiles from around the world that I am inspired to combine. The subsequent creative evolution is very organic. In this particular painting, you can see that I first painted a rich yellow-orange background on the canvas. 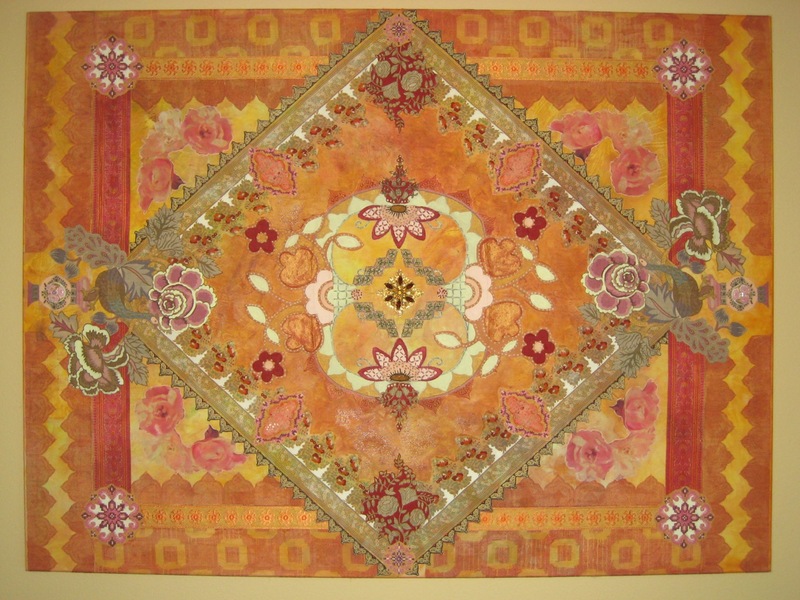 A pink silk sari with a very intricate pattern was then cut apart, reassembled in a geometric arrangement, and then adhered to the canvas with acrylic medium. 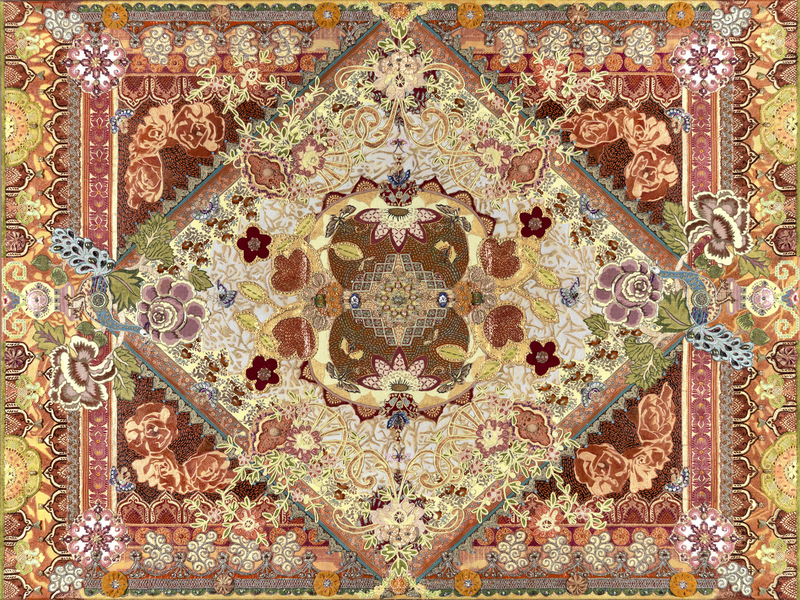 The center diamond is part of an antique silk scarf, fringed with vintage fabric from Iran. In the next stage you can see how I’m starting to add more textiles—silk ribbon from France, needlepoint medallions that I recycled from a tablecloth I got at an antique fair, Persian peacock motifs, a pillow cover embroidered with french knots that was never finished, etc. I also printed my own photos of roses onto silk and transferred them to the four corners of the canvas before painting over them. The lace that came in at the next phase really started to add some movement to the piece—it was from a very old and damaged lace tablecloth from the late 1800s that I got on eBay and cut apart very carefully. You can also see that I have built up a lot of layers of paint at this point. 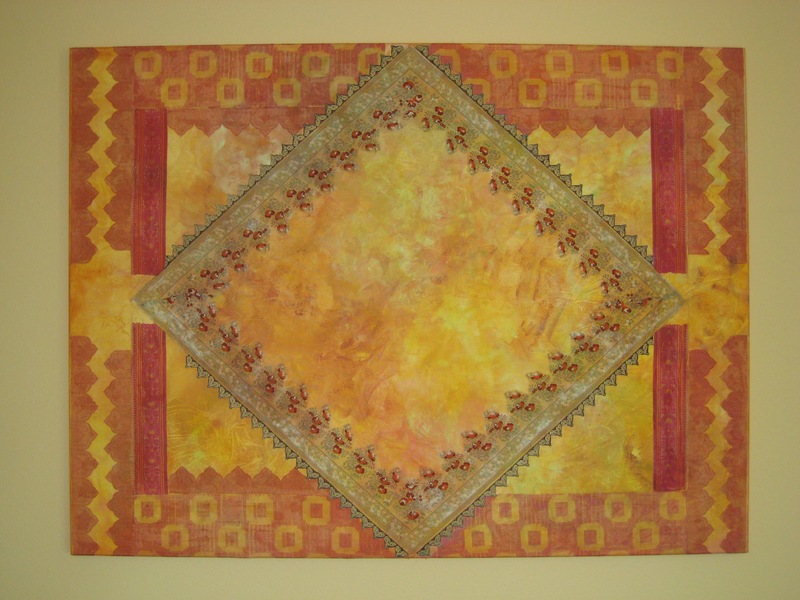 In some ways, I consider myself primarily a painter, although I love to use a lot of textiles and textile techniques in my pieces. These “beaded paintings” require many hours of hand-beading through the canvas, and in the end I feel that my paintings straddle the two worlds of painting and fiber art—they are paintings, but they include a lot of physical incorporation of textiles and references to textile techniques. In a close-up detail of the center of the piece you can also see that many of the “stitches” in the center and around the roses are actually painted. The stitches that hold my beads to the canvas are invisible, so I honor women’s handiwork by creating a very visible symbolic reference to it. I also find that the repetitive painted marks lend a lot of energy in a manner that is reminiscent of Aboriginal dot paintings. Many layers of paint give the piece a very rich and luminous feel; I work in transparent layers, so it’s almost like dipping a piece of batiked fabric in dye repeatedly. You can see in this close-up that there are artifacts from a variety of cultures—Chinese butterflies recycled from antique silk kimono sleeves and a vintage tablecloth, enameled bird medallions from Iran, vintage rhinestone earrings from the 60s, butterfly beads from Germany, etc. The finished piece is called “Dawn of a Golden Age,” because to me it symbolizes a new era of women having access to art education and being able to express themselves as artists. Many of the women whose textiles I recycle in my work didn’t have access to the art world and wouldn’t have had the opportunity or the vision to see themselves as artists. 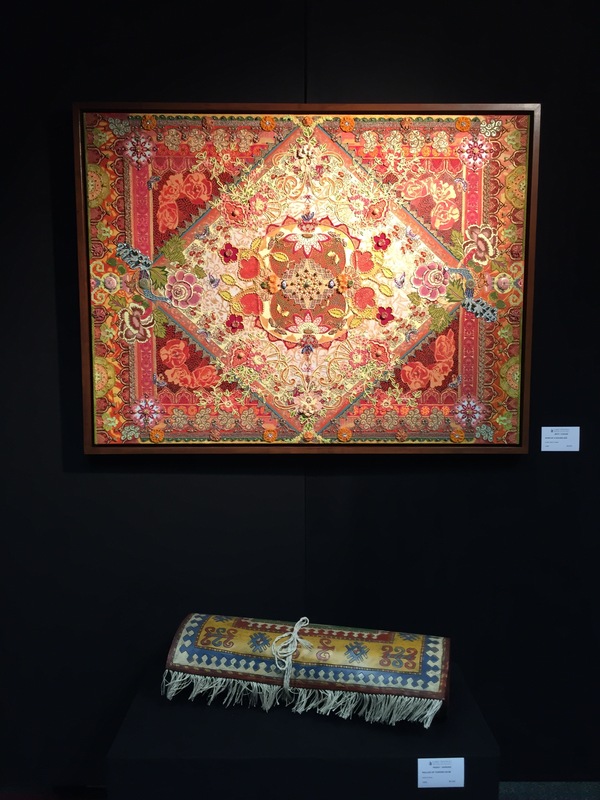 And here is a photo of “Dawn of a Golden Age” in the exhibit, above an amazing wooden scultpture of a rug by Peggy Harkins, another local artist whose work I love. I enjoyed your article so much, since your works constantly amaze me by their meaningful details, beautiful look and touching stories behind each one of them. It is always a treat to admire these pieces of art while listening to you talking about them.